I am of the belief that though toucans may not have the ability to speak as parrots do, this is not indicative of their intelligent capacity to comprehend them. Just as a child can understand the meaning of the words “hot” and “do not touch” in relation to the stove well before they can place them in a sentence, the toucans are also able to understand words and their meanings as they relate to them, even though they are physically unable to form the words themselves. Paco, Paz, & Pepe are incredibly curious and receptive to conversation. It has been seven months since we adopted them and they already recognize and respond to many verbal cues. All three know their names and are able to differentiate when I am addressing one of them specifically, regardless of whose cage I may be in. For example, if I am in Paco’s enclosure playing a game and I call out “Fancy Feet!” (one of Pepe’s myriad of nicknames) – Pepe will hop around with increased excitement, knowing I am speaking to him and including him in on the fun. Although they are as easily distractible as small children can be, the Three-Cans do make eye contact and give their attention when being spoken to. They listen and seem to attempt to understand what is being communicated to them. When I need to relay something important to the birds, I have taken to having a short, serious talk with them where I outline in my language everything that is important about what is going to be happening. I have definitely noticed a difference in their resulting behavior after our chats in comparison to when I do not have the talks first. For example, before I take Paco outside, he is always bouncing around with excitement, knowing he is going to be taken out to play. To prepare him, I lower my energy level and speak to him softly, explaining what is going to happen, the behavior I expect and need from him, and the reasons why. I believe that by setting and communicating an intention, I am able to influence a positive outcome. I can assure you that I’m not delusional – I understand that the birds do not comprehend the full meaning of my words. However, they do respond to the energy of the talk. The connection we make in that brief conversation seems to signify to them that something noteworthy is happening and they need to stay in tune with me. Paco’s behavior is always improved after these chats, which to me, means he is at least getting the gist of things. I have also noticed that the birds respond more positively to other people who speak to them. I am currently working on socializing them with all types of tourists, who I invite into the aviaries to give the birds a treat. Whenever a new person enters, it has become obvious that the Three-Cans are much more relaxed if the person speaks to them, rather than remaining silent. They seem suspicious and less trusting of the quiet people, who I am assuming seem quite mysterious to them. 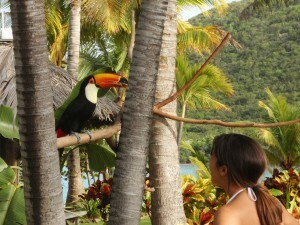 I have yet to find any analyses that compare the intelligence of toucans to parrots. It seems to be anyone’s guess if they possess the same capacity to learn and understand as parrots do. From what I can tell at this point, I do believe they are endowed with both a mental and emotional faculty exceeding that of other domesticated animals I have had the pleasure of spending time with. Either way, I would much rather make the mistake of over-estimating the Three-Cans intelligence than the opposite. I figure there is no harm in continuing my chats with the birds – you never know what they actually do understand and what they may be learning from it all. 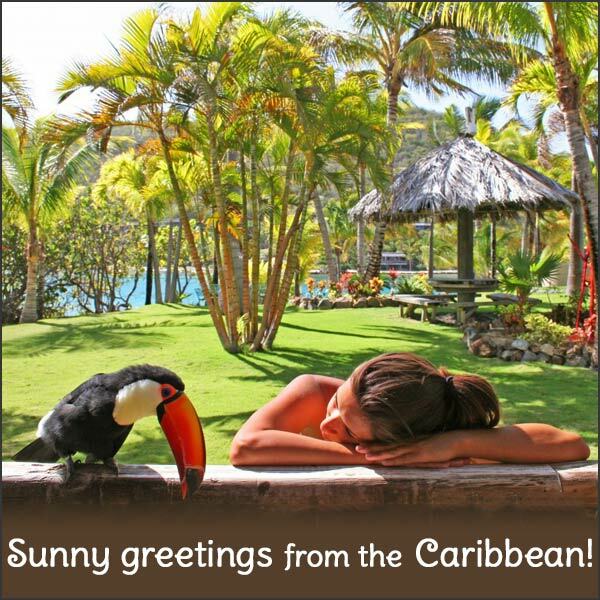 This entry was posted in Care, Enrichment, General Info, Training and tagged Adventures in Toucanland, bird, bird intelligence, birds, BVI, Caribbean birds, exotic birds, exotic pets, island, Paco, Paz, Pepe, pet, pet bird, pet birds, pets, Saba Rock, Toco, Toco Toucan, Tocos, Toucan, toucan intelligence, toucanland, toucans, tropical birds by Toucan Lady. Bookmark the permalink. I’ve always been impressed by the muscular body of toucans. I had no idea there were so many varieties. I’ve also suspected they are quite intelligent. Parrots, of course, are the pet of choice – so one won’t normally find a toucan in a pet shop. I’ve learned from this website and I thank you for sharing your experiences. You may find me in a park some day talking to the birds. I think I’ll try talking to a mocking bird. They seem to have quite a vocabulary.